August 08, 2009 | Comments (0) | by T.R. The wife is out of town, and by the good graces of Joseph Smith, the Cubs/Rockies tilt is being broadcast on the MLB Network. Granted, I have to listen to the no-name Rockies broadcasters, but that's OK. Anti-Cubs is better than no Cubs. 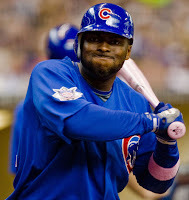 Milton Bradley is, for the second night in a row, batting in the two-hole! Obviously Lou reads TMS! So you think Milton will be equally inadequate regardless of where he hits? You would be wrong Chaim Witz! Milton Bradley will hit second, and he will be productive! He will then court your divorced mother, but he will ask your permission first. He will take her to Red Lobster and he will buy her a bottle of white wine! And when she's sick, he will cook her chicken noodle soup and rent "He's Just Not That Into You" even though he's already seen it! You know why he does this? Because Milton Bradley cares. He cares more than you and your heartless 'me first' attitude will ever know. The Cubs vs. Jason Marquis. Revenge is a dish best cooked while receiving felatio. Marquis was not the aberration tonight that he has been for the brunt of the season. He walked five Cubs in six innings, including a bases loaded free pass to Ryan Dempster. HA! But Dempster wasn't exactly Cy Young for the evening. Bradley and Ryan Theriot each knocked in a run with two hits, while Derrek Lee and Kosuke Fukudome contributed solo shots. Bradley also ran down a long fly ball at the wall to end the seventh and preserve the lead, and advanced Theriot in the ninth with a picture-perfect bunt. Then man can do it all if you simply embrace him! Carlos Marmol struck out the side in the eighth to preserve the 6-5 lead. Ultimately, the Cubs played some piss-poor defense in this one. A-Ram left with a sore left shoulder, naturally the shoulder that he dislocated earlier in the season. Lou thus used three third baseman in the game (Fox and Baker respectively). With the Cub fans vocally outnumbering the Rockies fans in the ninth, Kevin Gregg locked down the game with surprising ease. The Cubs don't gain any ground with the Cardinal win today, but Bradley is doing his part by (almost) single-handedly keeping the Cubs in this division.